Below, screenshot of Manhattan NYC Council Members on AskThem – dozens more CM’s from NY & other boroughs are findable on other pages (BK), and through search. Thank you for the opportunity to submit this testimony in support of online public petitions for NYC municipal government. We’re the Participatory Politics Foundation, a 501(c)3 non-profit organization with a mission to increase civic engagement and longtime member of BetaNYC. We’re heartened to hear of the proposed legislation by Councilmember Vacca for an online petition platform for NYC Council leadership. Official text of introduced legislation as of 9-02-14, 5:15pm. We believe a truly “bottom-up” tool for the public to petition their local elected officials offers a huge public benefit. As I wrote on Sept. 11th in a blog post on this topic, I was pleased that CM Vacca’s staff consulted with me & BetaNYC’s Noel Hidalgo in recent weeks, to gather input on the broad input of such an online petition platform for Council. 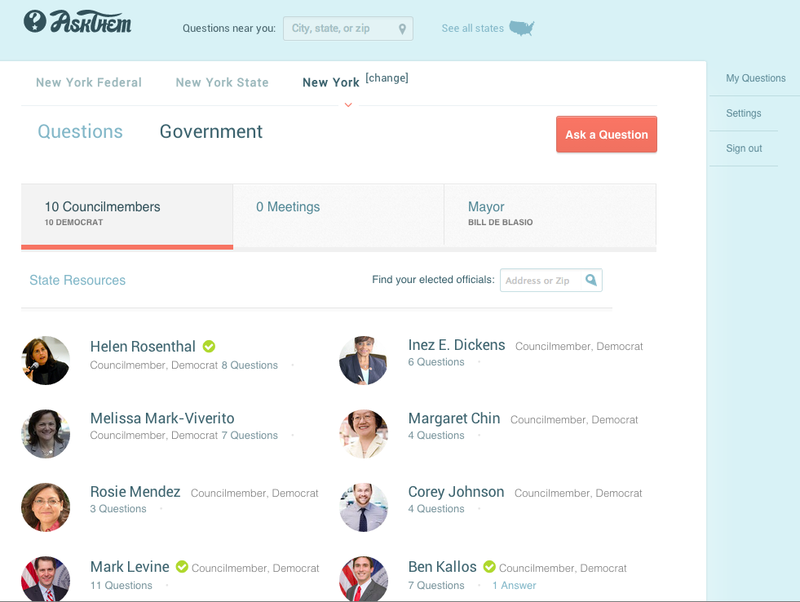 In February 2014, we launched our latest flagship project: AskThem, which works as a questions-and-answers and petition platform for NYC government. And not just New York city & state, but for public figures and politicians nationwide. AskThem is a version of the White House’s “We the People” petition site – where over 8 million people have taken action – but for every elected official: federal, state, county, and city levels of government. AskThem is uniquely free, open-source, non-profit and non-partisan, with open data for informed communities. 10 elected officials in NY have agreed to respond on AskThem to popular public questions – and AskThem has pages for nearly every CM, incl. CM Vacca from the Bronx. AskThem has access to official government data for over 142,000 elected officials nationwide, from local city council members up to the U.S. Congress. Questions on AskThem circulate like online petitions to a threshold, at which point they’re delivered over email and social media for a public response. Early AskThem adopters include Manhattan Borough President Gale Brewer, Council Members Brad Lander, Ben Kallos, Helen Rosenthal, Antonio Reynoso, Mark Levine, and NY State Senator Brad Hoylman. 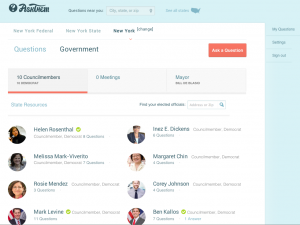 AskThem serves as a public accountability tool for continual dialogue with local elected officials and we welcome more volunteer partners in NYC Council offices, we provide this current platform at no cost. Enforcement so that any valid petition that reaches the threshold receives a public response within a set timeframe. Without this strong enforcement mechanism, the platform may lose public trust and momentum – see this article from our nonprofit advisor, Prof. Dave Karpf, “How ‘We the People’ Became a Virtual Ghost-Town”. Requirements that #PetitioNYC be interoperable with other open websites for civic engagement and online conversations. This would require, in technical implementation of #PetitioNYC, an open “read-write” API, so that independent websites can display popular petition information from #PetitioNYC for their communities. And so that #PetitioNYC may intake popular petitions on other sites, such as non-profit AskThem or commercial websites such as Change.org and others. It would prefer open-source code & libre licensing, which is important if this NYC legislation serves to become a national model for online petitioning. In fact, AskThem can provide this same petition functionality to the City Council and wider public straightforwardly and affordably off our existing code. One development path is to build free petition widgets that embed on council members’ pages, then delivers user petition information by email or API to central council staff, however preferred. This buildout would likely cost a fraction of having DoITT start anew, even leveraging the free software available. How and when to verify that a #PetitioNYC site user is a constituent of a given NYC council district. On AskThem, we enable questions to be published and shared, and if they approach threshold we check zip-codes on user signatures and the district of the petition creator / sponsor. This generates more public conversation, which we view as much needed. Signature thresholds – currently the AskThem threshold-for-question-delivery to a city council member’s office is 25 user signatures, of which approx. half should be constituents. It’s straightforward to do common-sense, brief staff outreach to petition creators to check their good faith. We aspire to a threshold of 0.1% of a jurisdiction’s population, which if a city council district has appox. 175,000 residents, would be 175 signatures – this is our target metric for state & federal districts in the future as well. Open-source code – our AskThem code is open and ready to remix, and several other solutions are available, including the White House’s “We The People” code. We’d be excited to work with DoITT on re-using our open Ruby on Rails code and customizing it for city council staff members as a national example in free software. Online dashboards – I praise CM Vacca’s draft legislation for maintaining an “automated reporting system, available to the public” of petition info – this is a strong accountability feature, if its data is kept timely and displayed transparently. We look forward to continuing to work with CM Vacca’s office on developing a free, open, responsive petition platform for NYC Council. Glad to see NYC Council Tech Committee and leadership pushing ahead the state of the art for accountable digital government. David Moore & Maryam Gunja – Participatory Politics Foundation – AskThem.io – drm@ppolitics.org – (nine then one then seven) 753-3462 – we’re based in NYC, come visit us.